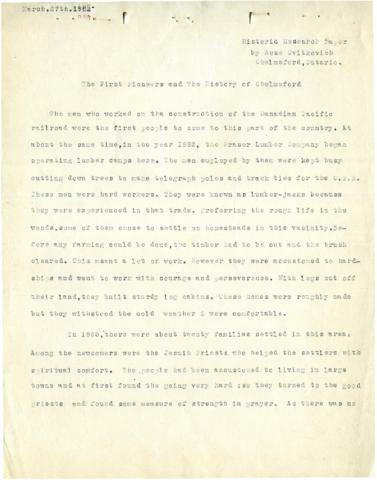 Item is a six page, typewritten, annotated paper by Rose Cvitkovich on the history of Chelmsford, Ontario between 1882 and 1952. Two handwritten edits to the text can be found on page five. The paper covers the first settlers in Chelmsford, the history of the Catholic Church in that parish as well as the history of two short-lived Protestant churches and touches on prominent individuals within the community, such as Raphael Groulx, the first mayor; Elzear Belanger, the first merchant and post master; Hugh Gratton, post master; and Dr. Rodolphe Tanguay, general practitioner. Prominent women mentioned within the essay include church decorators Mrs. D. Seguin, Mrs. Raphael Groulx and Mrs. Clement Methe.